Are you in the content delivery business... and you know the links your web visitors click when browsing a page in your portal??? Probably you may already be using a way to check which pages your visitors browse (e.g. logging) or some external tool (such as Google Analytics). Clicking though on a web link is not the same as a page load, since there are inbound (to the same page, to the site) and outbound (to other pages and sites) links. A link click will lead to a page being loaded, but it may not. A link click will initiate a browser request; the browser will try to find the domain name, later it will send the page request and wait for the response. In the mean time the user may change its mind from waiting the page to load. Another problem with page loading, as it is captured with DotNetNuke logging, is that it may not be accurate; just because the visitor closed the browser before the page finish loading. Using a page load tracking mechanism you can find out the page a user landed. A visitor though may enter your website by several external links pointing your portal (e.g. organic search), and exit - simply - by closing their browser or navigating back to the original page (i.e. search results) by pressing the "Back" button on their browser, without clicking any links on your page. So in this case logging page requests does not give you an information about user navigation on the page or the links the user clicked. As it is clear by now, there are cases when we want to capture clicks originating by physical - real - users for several reasons; just because you want to improve your linked paths or just because you want to improve you content or the quality of your services. The link they followed to leave the page. This is also important because reveals how the visitors abandoned your website. Do people actually read the detailed article by clicking the 'details' link, or they just have a peek on the articles' summary in the news page? On a page displaying several information simultaneously, what are the links preferred the most - what are the links received the most clicks? For each anonymous user, what are the pages they browsed and how they moved among them (clicks trailing paths)? If you wrote an article referring to a resource or an affiliate, you may want to know if the article achieved the goal and forwarded its readers to your associate's web page. These are only few examples on what kind of information you can extract using this module. There are many other examples in the World Wide Web, since the web itself is a collection of links. But since you will create your own database of link clicks for your website, you can use also a reporting tool to create your own automated reports and extract trends or build prediction models. When using DotNetNuke link tracking capability, you may notice the the link is not CEO friendly anymore. Also if you have mixed content with internal and external links and you have some links that you have enabled DNN click track and others that you did not enabled click tracking, on the DotNetNuke link control, you know that changing all links in your website to enable click tracking may not be feasible. So, using this module you do not have to change anything! You can enable the module in a page and using DotNetNuke embedded functionality you can 'copy' it in all your portal pages. So in two simple steps you have enabled click tracking in all your web pages. Also NetBrood Click Trace offers a simple interface to extract more powerful information about links clicked in your web site - using a simple search form. Last if you can enable (or disable) its functionality on demand in any page, by checking just a check box. One other powerfull feature about this module is, the checks on the connecting visitors so that it will not work with automated bots or web spider applications. This way you will know that all the clicks on your web pages, are genuine produced by physical visitors - actual users. Furthermore, you can extract the links clicks information to a CSV file and process it using some external spredsheet tool (such as OpenOffice Calc or Microsoft Excel). Module has no user interface for the unauthorized user. So in a web page it will be seen like bellow. *The images are from a DotNetNuke 4.5.3 demo installation but the module has been tested also for all the versions of DotNetNuke 9.0.0. The settings for this module are very minimalist. Actually there are only two check boxes to enable its functionality on the page the module is placed. 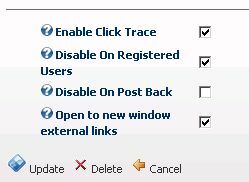 Disable Click Trace module functionality for unregistered visitors, so that you can collect link click information only for unauthorized visitors (or unregistered visitors). Disable Click Trace when page posts back e.g. when using a dynamic module, that process some information and also logs things so that you will not keep double info. This way click trace will capture only first genuine click on the dynamic module link. Also, using this module you may enable clicks trace to open external links to open to new browser window when ckicked. This minimal set of settings can be combined with the embedded ability of DotNetNuke to display the module in all the pages. 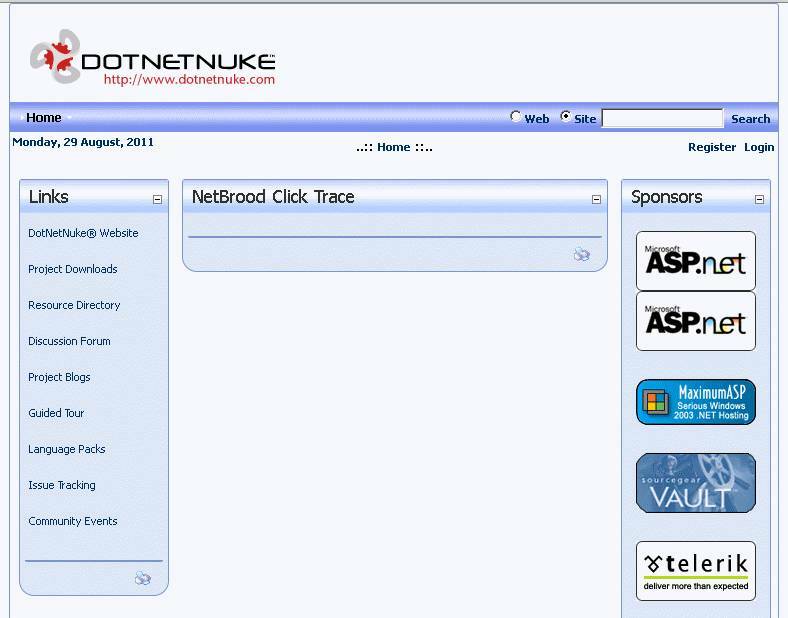 So automatically you have enabled (or disabled) the Click Trace module in all the pages in your DotNetNuke portal. This module allows you to process the information collected and extract meaningfull infromation about links clicked on your pages. 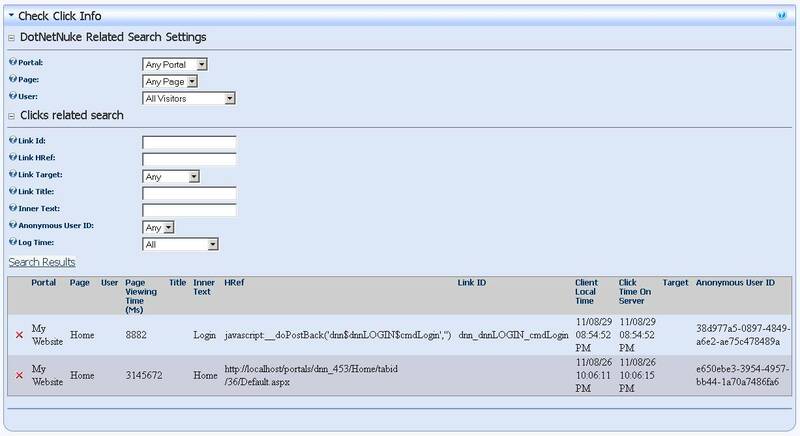 Using this analysis control, you may extract meaningful infromation about link clicked in your web portal. In version 1.6.3 - we added a configurable setting to delete old history of clicks. In this version - 1.5.1 - we added the ability to export content to a comma separated values (CSV) file so that you could also process your captured clicks with some external processor such as Open Office Calc or Microsoft Excel. The analysis control is separated to the portal related section and module details section. 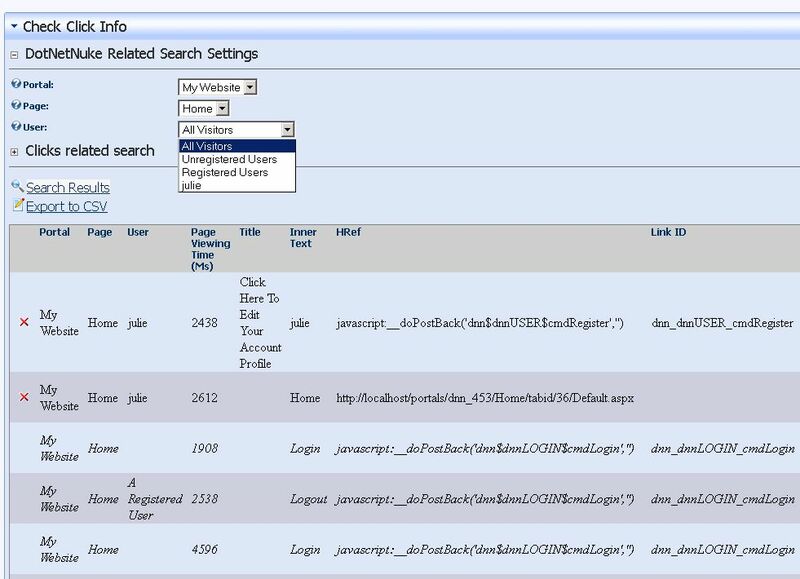 So you can analyze click info database based on the portal settings or properties related to link clicks. Page administrators can delete entries for the displayed page results one by one, or the entire page results as it is indicated by the page index in the bottom of the results. If you are really interested in this module please check the license agreement and module documentation before using it; for further information and open issues (e.g. with DotNetNuke and links being traced). If you have any questions you can contact us through the help desk or via contact page in our website. try a live demo in our website. NETBROOD.COM END-USER LICENSE AGREEMENT ("EULA") FOR NETBROOD.COM CLICK TRACE ("NB CLICK TRACE") MODULE. IMPORTANT PLEASE READ THE TERMS AND CONDITIONS OF THIS LICENSE AGREEMENT CAREFULLY BEFORE INSTALLING OR USING THE LICENSED NETBROOD.COM SOFTWARE PRODUCT AND/OR ITS RELATED MATERIALS. END-USER LICENSE AGREEMENT ("EULA"); IS A LEGAL AGREEMENT BETWEEN YOU (EITHER AN INDIVIDUAL OR A SINGLE ENTITY) AND NETBROOD.COM, FOR THE NETBROOD.COM SOFTWARE PRODUCT(S) IDENTIFIED ABOVE WHICH MAY INCLUDE ASSOCIATED SOFTWARE COMPONENTS, MEDIA, PRINTED MATERIALS, AND "ONLINE" OR ELECTRONIC DOCUMENTATION ("SOFTWARE PRODUCT"). BY INSTALLING, COPYING, OR OTHERWISE USING THE SOFTWARE PRODUCT, YOU AGREE TO BE BOUND BY THE TERMS OF THIS EULA, INCLUDING THE LIMITATIONS AND WARRANTY DISCLAIMERS. THIS LICENSE AGREEMENT REPRESENTS THE ENTIRE AGREEMENT, CONCERNING THE SOFTWARE PRODUCT, BETWEEN YOU AND NETBROOD, AND IT SUPERSEDES ANY PRIOR PROPOSAL, REPRESENTATION, OR UNDERSTANDING BETWEEN THE PARTIES. IF YOU DO NOT AGREE TO THE TERMS OF THIS EULA, DO NOT INSTALL OR USE THE SOFTWARE PRODUCT AND IMMEDIATELY DESTROY ALL COPIES OF THE SOFTWARE PRODUCT AND/OR RELATED MATERIAL IN YOUR POSSESSION. THE SOFTWARE PRODUCT IS LICENSED, NOT SOLD! NETBROOD.COM HEREBY GRANTS TO YOU A NONEXCLUSIVE, NONTRANSFERABLE, PERPETUAL, WORLDWIDE LIMITED LICENSE (WITHOUT THE RIGHT TO SUBLICENSE) UNDER NETBROOD.COM INTELLECTUAL PROPERTY RIGHTS THAT ARE ESSENTIAL TO PRACTICE THIS SPECIFICATION. THE SOFTWARE PRODUCT IS LICENSED, NOT SOLD. THIS IS A LICENSE AGREEMENT, AND NOT AN AGREEMENT FOR SALE. NETBROOD.COM RETAINS OWNERSHIP OF THE COPY OF THE SOFTWARE IN YOUR POSSESSION, AND ALL COPIES YOU MAY BE LICENSED TO USE. NETBROOD.COM RETAINS ALL RIGHTS NOT EXPRESSLY GRANTED TO YOU IN THIS EULA. NETBROOD.COM HEREBY GRANTS TO YOU, AND YOU ACCEPT, A NON-EXCLUSIVE, NON-TRANSFERABLE LICENSE TO USE, COPY OR MODIFY SOFTWARE PRODUCT ONLY AS AUTHORIZED BELOW. A) NETBROOD.COM grants you a non-exclusive, non-transferable right to use this module on your DotNetNuke ("DNN") installations according to the license edition purchased. Standard Edition: One Production License is required to install and use this module on ONE (1) DNN PORTAL as it is identified by a unique domain name (e.g. "www.mysite.com" and "mysite.com" are considered as the same domain name). You must purchase additional Production License for each and every extra domain name, even if that domain name is a subdomain of the domain name of the one you have purchased the license or is served by the same DNN installation (e.g. "sales.mysite.com" is another domain name and if you plan to use this SOFTWARE PRODUCT to such a domain you have to purchase an extra Standard Edition license). Note: DotNetNuke Child Portals such as "www.mysite.com/sales" are not considered different domain and as such do not require additional domain licenses. Professional Edition: One Production License is required to install and use this module on ONE (1) DNN installation. DNN is an excelent framework for building multiple portals using one installation. If you have a DNN installation serving multiple portals, each accessed by each own domain name, you may have to consider using this license agreement. Otherwise you have to purchase a Standard Edition license for each domain name your DNN installation serves. Enterprice Edition: One Production License is required to install and use this module on ANY DNN installation you or your entrerprise performs on behalf of its customers. If you are an enterprise or a DNN professional building DNN webistes and require a valid license to use this SOFTWARE PRODUCT in any installation, then maybe you have to consider using this license agreement. Otherwise you have to purchase a Standard Edition license for each portal accessed by a domain name or a Professional Edition license for each multiple portal DNN installation. IMPORTANT: You acknowledge that valid license acquisition and installation is an integral part of the operation of the software product. Also you understand that failure to comply may lead to production errors during the operation of the SOFTWARE PRODUCT or failure to operate after a period of 90 days. You may not distribute registered copies of the SOFTWARE PRODUCT or source code received, or any other source code derrived from that, or any product produced using the source code or its derrived versions, to third parties. You may purchace a valid license for third parties, as long as those parties are your customers, but you cannot distribute any copy of this SOFTWARE PRODUCT. Evaluation versions may be seeked on NetBrood.COM website (http://www.netbrood.com). You may not reverse engineer, decompile, or disassemble the SOFTWARE PRODUCT, except and only to the extent that such activity is expressly required by applicable law notwithstanding this limitation. You may not rent, lease, or lend the SOFTWARE PRODUCT. You may ask for evaluation versions on NetBrood.COM website (http://www.netbrood.com) but in order to use the software product in your website you have to purchase the proper license from its distributors. You must comply with all applicable laws regarding use of the SOFTWARE PRODUCT. You are mot allowed to use this product illegaly or in a way that the low does not permit it. In such event of illegal use, you and *only you* shall be responsible that. Without prejudice to any other rights, NETBROOD.COM may terminate this EULA if you fail to comply with the terms and conditions of this EULA. In the event of termination, you must destroy all copies of the SOFTWARE PRODUCT and Software License, including all backup copies, from the Server and all computers and terminals on which it is installed and any related material such as its component parts, source code, associated documentation etc. From time to time, NETBROOD.COM may change the terms of this EULA. NETBROOD.COM may notify you of such change. Your continued use of the SOFTWARE PRODUCT will indicate your agreement to the change. All title, including but not limited to copyrights, in and to the SOFTWARE PRODUCT and any copies thereof are owned by NETBROOD.COM. This EULA grants you no rights to use such content. All rights not expressly granted are reserved by NETBROOD.COM. NETBROOD.COM EXPRESSLY DISCLAIMS ANY WARRANTY FOR THE SOFTWARE PRODUCT. THE SOFTWARE PRODUCT AND ANY RELATED DOCUMENTATION IS PROVIDED 'AS IS' WITHOUT ANY EXPRESS OR IMPLIED WARRANTY OF ANY KIND, INCLUDING BUT NOT LIMITED TO ANY WARRANTIES OF MERCHANTABILITY, NON-INFRINGEMENT, OR FITNESS OF A PARTICULAR PURPOSE. 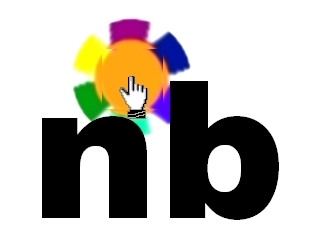 NETBROOD.COM DOES NOT WARRANT OR ASSUME RESPONSIBILITY FOR THE ACCURACY OR COMPLETENESS OF ANY INFORMATION, TEXT, GRAPHICS, LINKS OR OTHER ITEMS CONTAINED WITHIN THE SOFTWARE PRODUCT. NETBROOD.COM FURTHER EXPRESSLY DISCLAIMS ANY WARRANTY OR REPRESENTATION TO AUTHORIZED USERS OR TO ANY THIRD PARTY. YOU ALSO ACKNOWLEDGE THAT THE SOFTWARE MAY NOT BE FREE FROM DEFECTS AND MAY NOT SATISFY YOUR NEEDS. IN NO EVENT SHALL NETBROOD.COM OR ITS DISTRIBUTORS BE LIABLE FOR ANY DAMAGES WHATSOEVER (INCLUDING, WITHOUT LIMITATION, LOSS OF PROFITS, BUSINESS INTERRUPTION, OR LOSS OF INFORMATION, OR ANY OTHER LOSS) ARISING OUT OF THE USE OF OR INABILITY TO USE THE SOFTWARE PRODUCT AND/OR RELATED MATERIALS, EVEN IF NETBROOD.COM HAS BEEN ADVISED OF THE POSSIBILITY OF SUCH DAMAGES. IN NO EVENT WILL NETBROOD.COM BE LIABLE FOR LOSS OF DATA OR FOR INDIRECT, SPECIAL, INCIDENTAL, CONSEQUENTIAL (INCLUDING LOST PROFIT), OR OTHER DAMAGES BASED IN CONTRACT, TORT OR OTHERWISE. NETBROOD.COM SHALL HAVE NO LIABILITY WITH RESPECT TO THE CONTENT OF THE SOFTWARE PRODUCT OR ANY PART THEREOF, INCLUDING BUT NOT LIMITED TO ERRORS OR OMISSIONS CONTAINED THEREIN, LIBEL, INFRINGEMENTS OF RIGHTS OF PUBLICITY, PRIVACY, TRADEMARK RIGHTS, BUSINESS INTERRUPTION, PERSONAL INJURY, LOSS OF PRIVACY, MORAL RIGHTS OR THE DISCLOSURE OF CONFIDENTIAL INFORMATION.